Welcome to Antlerknobs.com by Crooked Creek Antler Art. We have been in the antler art business since 1998. 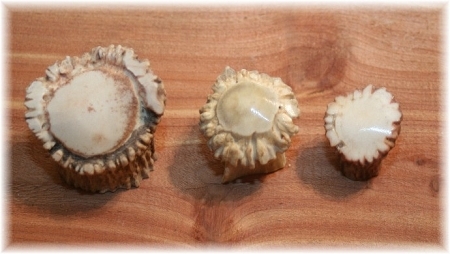 We started with smaller items, including the natural shed antler knobs and antler pulls. Over the years we have expanded our product line to include more than 300 antler items. 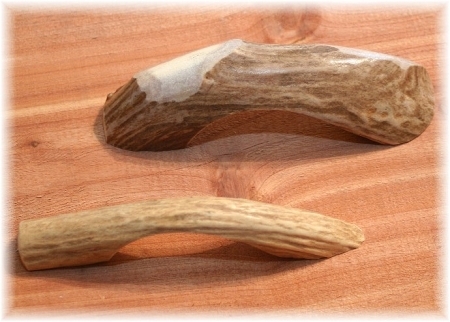 This site is dedicated exclusively to our All Natural Antler Cabinet Knobs and Antler Drawer Pulls. Each year we cut thousands of antlers and it is our goal to use every inch of the antler. These knobs and pulls look great whether your using 4 for your office desk or 25 for your kitchen cabinets. They are a great enhancement to any cabinet or furniture piece and work with almost any decor. At Crooked Creek Antler Art, we use only the best antlers. We take great pride in every product that we make and if it is not good enough for our homes -- we don't ship it out.